Kung Hey Fat Choi! Chinese New Year celebrations brighten up the winter months throughout Asia and Asian communities around the world. It's the most important date on the Lunar calendar and includes weeks of festivities with family and friends from late January through March. Many activities give everyone a chance to get into the spirit of a fresh, healthy, happy and prosperous upcoming year. Among the many outstanding traditions like lion dances, flower markets, decorations of lanterns, red and gold banners, and orange trees, wearing of red, temple visits, parades, fireworks, family gatherings and gift giving, are, of course, special Chinese New Year feasts. It's considered one of the world's best festivals, with Victoria Harbour's neon spectacle as a backdrop to 6000 tonnes of fireworks, parades, flower market, temple celebrations and lucky New Year's horse races. Manila's Binondo district is the oldest Chinatown in the world, and appropriately, host of the Guinness world record Chinese New Year's celebrations. Its standout moment is a laser show and a one-of-a-kind LED Lion Dance. Chinese New Year involves weeks of festivities including an International Lion Dance Competition, a riverside carnival, and over 10,000 performers in the continent's largest street procession. This West Coast city's Chinatown is famous, so naturally, it's 2-week CNY celebrations are, too. Flower festivals, a breathtaking, 200-foot dragon finale to the largest CNY parade outside of Asia. Food is central to the celebrations, and almost every dish carries symbolic meaning or color, or a name that sounds like the Chinese characters for Chinese New Year wishes like longevity or wealth. 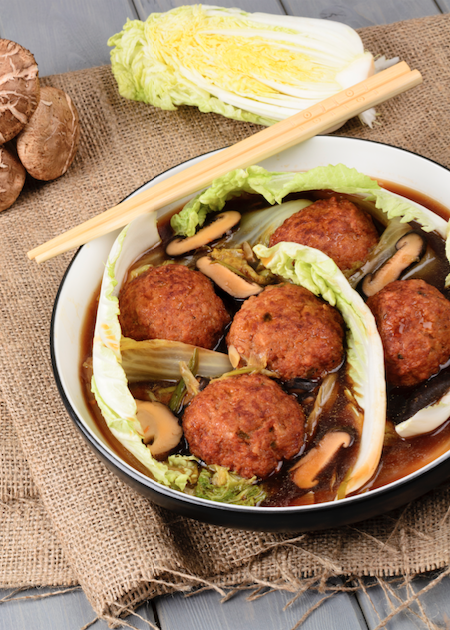 Our friends at Hong Kong Tourism have shared with us their recipe for Lion's Head Meatballs – also called Four Joys Meatballs. It's a pork recipe - which seems especially suitable for Year of the Pig – but is equally tasty and relevant no matter which creature's year of the Chinese zodiac it is. The round shape of meatballs symbolizes 'togetherness', and the Lion's Head evokes Chinese New Year Lion dances. It's easy enough to make at home for your own Chinese New Year celebration or any time you crave it. Put ground pork into a large bowl. Add Shaoxing wine, light soy sauce, dark soy sauce, sesame oil, salt, sugar, grated ginger, cornstarch and scallion. Add chestnuts, mushroom and eggs. Add panko. Mix all ingredients til sticky and moist. Divide into 6-8 parts. Roll each part into a large ball. Heat vegetable oil in a non-stick skillet over medium high heat til warm. Fry meatballs til all sides browned. Take out and place on paper towels to absorb oil. Place bruised ginger slices in bottom of a clay pot or any round pot. Fill with chicken broth or water. Put in cabbage leaves. Arrange browned meatballs on top. Cover and heat in medium high temperature til boiled, lower heat and simmer for 10 minutes. Add salt or soya sauce to taste. Garnish with chopped scallion or parsley (optional). Ready to serve over steamed rice. You can make and cook the meatballs in advance and do the final heating in broth when you want to serve the meatballs.